Who is contributing data to PhenomeCentral? PhenomeCentral is a repository for secure data sharing targeted at clinicians and scientists working in the rare disorder community. We encourage global scientific collaboration while respecting the privacy of patients profiled in this centralized database. The same undiagnosed disorder may be present in only a handful of individuals seen at different hospitals from different corners of the world. The PhenomeCentral collaboration model allows clinicians and scientists to learn about the existence of cases similar to theirs, which may help to improve understanding of disorder manifestations and confirm underlying causes. The semantic model, which is the basis of our matching process, helps reveal subtle similarities between disorder manifestations and may provide justification for reconsidering diagnoses that were initially discarded due to atypical phenotypes. Several major rare disease research programs, including the Canadian CARE for RARE Project, the RD-Connect Project and the NIH Undiagnosed Diseases Program, are contributing interesting cases to PhenomeCentral. Together, we are building an extensive rare disorder knowledge base, and are establishing collaborations in the search for the underlying genetic causes of unsolved cases. PhenomeCentral currently has 1369 members, who have contributed hundreds of cases that are available for phenotype matching. Additionally, all registered users have view-only access to cases that have been made public by other users. Please use the SIGN UP button on the homepage to request a PhenomeCentral account. You will be asked to provide your name, affiliation, an institutional email address, and confirmation that you intend to contribute real de-identified data to PhenomeCentral. The identity of all prospective users requesting accounts is verified before granting them access to PhenomeCentral. It may take a few days for your request to be accepted. This process is a part of our efforts to ensure that the PhenomeCentral database is populated only with real, high-quality profiles of patients with rare disorders. share scientific information with other contributors. The MY DATA box lists the patient records owned by the current user. Please read below for more information about data ownership. 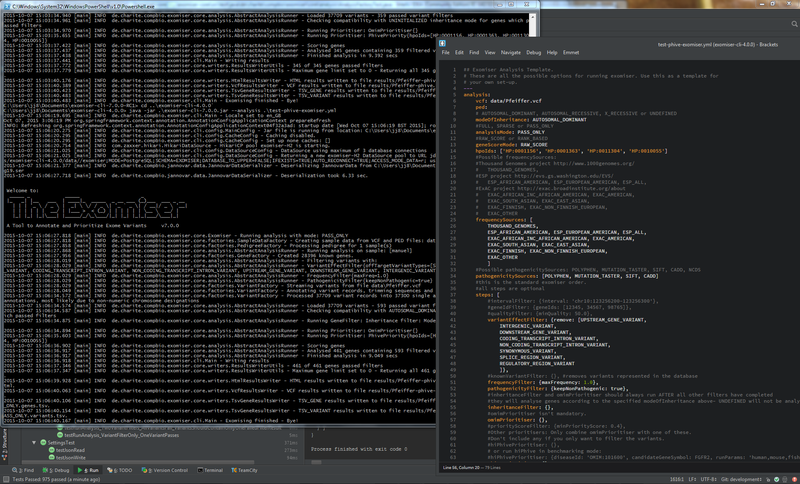 The DATA SHARED WITH ME box lists the patient records for which the current user is a collaborator either because he or she is part of the group which owns the record, or because the owner explicitly listed them as a collaborator on that record. Please read below for more information about specifying collaborators. The PUBLIC DATA box lists the patient records that are available for viewing to all registered users. The homepage is immediately accessible from any other page by clicking on the PhenomeCentral logo or on the home icon ( ) displayed at the bottom of the page header area. PhenomeCentral relies on the PhenoTips software for data entry and storage. 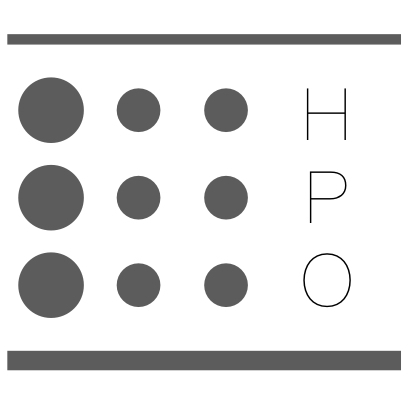 PhenoTips enables data capture and storage using the standardized vocabulary defined by the Human Phenotype Ontology (HPO). PhenomeCentral relies on the semantic phenotype relations defined by the ontology to identify the most relevant patient profile matches and to help users discover clusters of patients that may suffer from the same disorder. 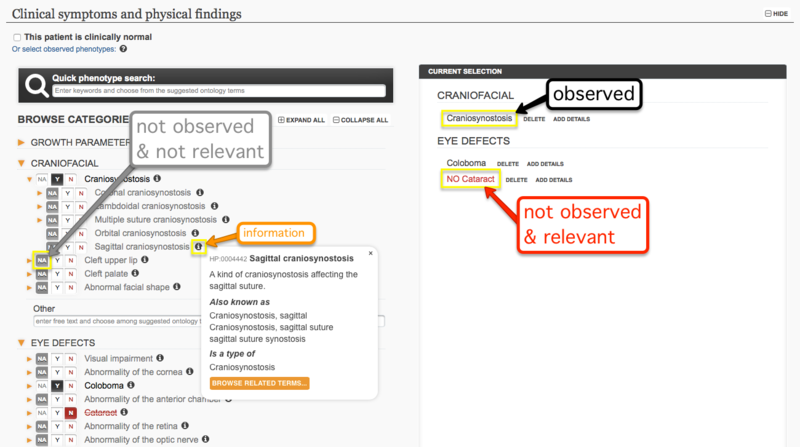 Phenotypes can be selected from a predefined list of common manifestations, or by searching the entire ontology using the Quick Phenotype Search field for the relevant manifestations that users have observed in their patients. A phenotype can be marked as observed (Y), not observed and relevant (N), or not observed and/or not investigated, i.e. irrelevant (NA). It is not necessary to specify that a phenotype listed in the form is NOT present, unless the information about its absence is considered particularly relevant. Each phenotype can be annotated with information such as age of onset and pace of progression, which will help narrow down the possible diagnoses and find the most relevant phenotype matches in the database. It is important to know that while free-form text can be entered, these entries are not searchable or matchable within the registry. Therefore, users are encouraged to provide detailed phenotypic descriptions using ontology terms, as more precision will lead to a more accurate knowledge base for the community, as well as to better case match results for the contributor. Entries owned by a contributor can be accessed at any time via the "MY DATA" box displayed on the homepage. Users can also modify or delete the patient profiles via the patient report menu available on the right side of the page. 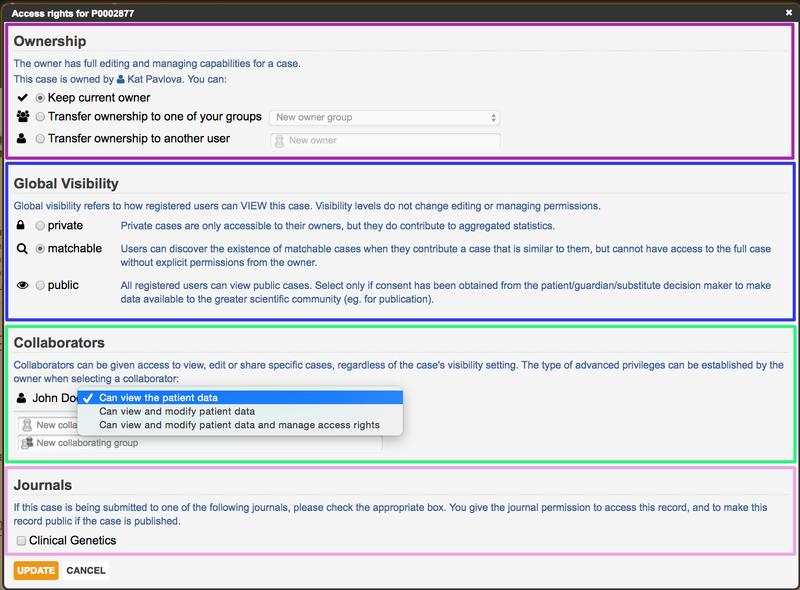 Patient record ownership, visibility, and collaboration can all be managed within the Modify Permissions setting, which is found in the upper-right area of the patient record. 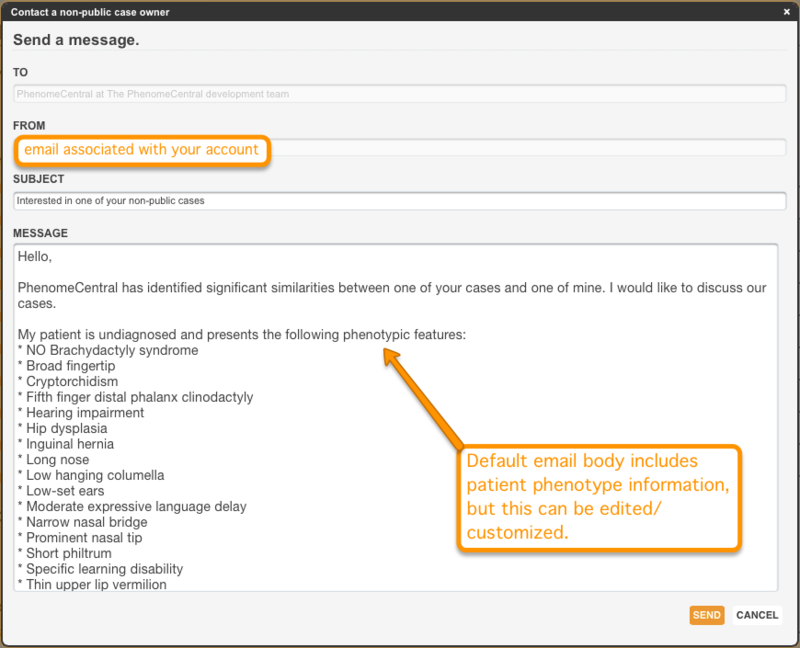 As well, if you are using PhenomeCentral for the purpose of submitting a case to a journal, you can share the record with them through this setting. By default, you are the owner of any data that you have entered in the repository. Owners of a patient record can edit the record, choose to share the record with collaborators, and manage the record. Under certain circumstances, you may wish to transfer ownership of a patient record to a larger consortium if you and your case become part of a wider study, or to another PhenomeCentral contributor if for any reason they become responsible for following that specific patient. When viewing or editing a patient record, the owner is displayed at the top of the page. Ownership can be modified by the owner, i.e. transferred to one of the owner's groups or to another user. By default, cases are set to be matchable. When viewing or editing a patient record, the visibility is displayed at the top of the page. Visibility can be modified both by the record owner and by those collaborators that have permissions to manage access rights. Adding collaborators allows you to give a trusted colleague access to one of your non-public cases, as well as optional editing capabilities to any of your cases. Some journals require cases to be submitted to a restricted-access database as a condition of publication. If you are submitting a patient record to a journal that has partnered with PhenomeCentral, you can easily grant the journal access to this record by selecting the journal from the Journals section of the permissions popup. Owners of matchable or public records can see the existing matchable and public cases that are most similar to theirs. PhenomeCentral uses an algorithm that assesses the similarity of accessible cases based on the provided phenotypes (i.e. the selected Human Phenotype Ontology (HPO) terms). The algorithm finds cases with similar terms based on the Human Phenotype Ontology (HPO), prioritizing matches with more similar terms and more informative terms (i.e. rare phenotypes as assessed by numerous sources). For example, cases that share the term "oculomotor apraxia" would be a better match than cases that share the term "apraxia", while the algorithm will recognize that "intellectual disability" and "global developmental delay" are terms that share some phenotypic similarity, even though they are not exact matches. 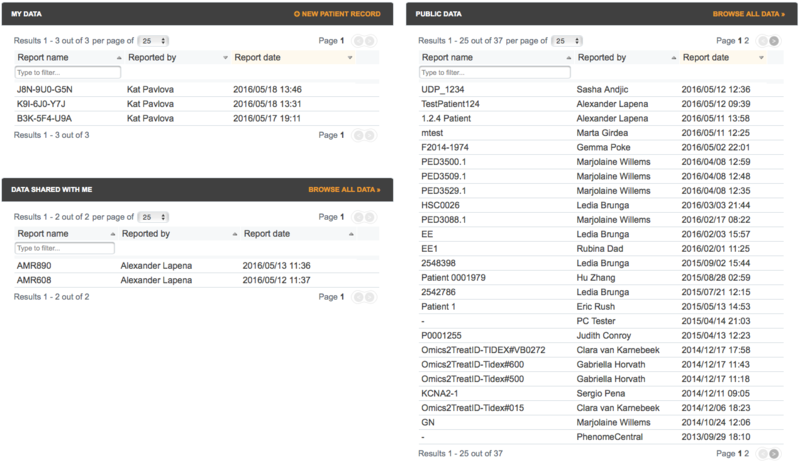 After creating a patient record, contributors can see the most similar cases found in the database displayed at the bottom of the page. The list is re-generated each time the user accesses the patient record and may change as data is modified for that record or for other records in the database. Private and hidden cases do not participate in any way in the similarity matching process. If your patient record is private or hidden, you will not be able to see similar cases, and your case will not be included in the list of matching similar cases for any other users. If you wish to benefit from the system's similarity feature, please consider giving your records at least the matchable visibility level. When comparing phenotype and genotype similarity between two cases, keep in mind that the information available for the matching case depends upon visibility level. Public cases that are similar are displayed without restrictions, while for matchable cases the features that have contributed to the high similarity score are hinted at without disclosing specific information. Selecting the case Contact opens a popup through which the case owner can be reached by email. The owner may choose to answer or ignore this discussion request. In this way, owners of cases set to matchable can become collaborators on cases of mutual interest, and can allow one another varying levels of access to individual cases. It is not necessary for PhenomeCentral users to create accounts on these databases to discover matching patient profiles. When first creating a patient record, you will be presented with 5 checkboxes for confirming patient consent. The 5th box must be selected in order to have your patient match with any patients over the MME. After creating a patient record and selecting Save and View Summary, the data is compared against all other patient records in PhenomeCentral only. If you scroll to the bottom of the summary page, you will see a section for Matches in partner MME databases. By selecting Find matches, you can choose to have the data compared against patients deposited in each of the databases connected to PhenomeCentral through the MME. If PhenomeCentral enables a research publication, the authors must acknowledge PhenomeCentral using the following wording: "This study makes use of data shared through the PhenomeCentral repository. Funding for PhenomeCentral was provided by Genome Canada and Canadian Institute of Health Research (CIHR). Please address your questions or report issues encountered while using PhenomeCentral to support@phenomecentral.org.